I would like to see a hack for the arcade & console ports of Ultimate Mortal Kombat 3 that will add Johnny Cage from Mortal Kombat Trilogy to the main roster by adding him next to Sub-Zero and make Classic Sub-Zero a hidden character. I love the pkmn red colorized hack -> https://www.romhacking.net/hacks/1385/. I tried searching for a good while now and couldn't find an answear to my question. Is it possible for anyone to convert the ips patch so that it works on the GERMAN rom of the game? the game in germany is named "Pokémon Rote Edition" or "Pokémon Rot" for short. I really love the hack but I am too nostalgic vor the german names so playing in english is not really a fullfilling option. Would be so happy if someone could help me, thanks for reading! One of the biggest flaws of the very interesting Blaster Master on the Nes is that for a new player, it is too easy to lose a weapon upgrade, which often makes visiting some places not worthwhile at all. It could be interesting to make the player lose a weapon upgrade unit not everytime he is hit, but maybe 1 time out of 2 or even 4? Someone should make a mod that removes the infamous bike level or shortens it so people can enjoy the game rather then progress coming to a half 3 stages in. Someone should make the effort to colorize this. Super Mario Land 1 and 2 have been hacked into color. Wario Land 2 and 3 had color releases, making Super Mario Land 3, the middle game in the series, the only game not available in color. I great idea for a hack would to be to circumvent the Amigos System in Sword of Mana on Gameboy Advance so you can complete all the quests in the game. As is, you cannot complete quest 41 as it requires showing an Chekov a summon card only acquirable via registering friend to your game. Perhaps even a hack that marks the quest completed. I want to see a 2D Final Fantasy III remake for the Game Boy Advance. Make it a hybrid of FF I+II as far as graphical portrayal goes and just hack the original content into the game such as the monsters etc... and a nice soundtrack for it. In line with the 2D FF titles on GBA and PSP add additional content to the game. Super bosses, extra areas etc just ignore the 3D version's attempt at giving the party members a backstory leave them as Ur onionkids. If this is too much at the moment, I wonder if Maeson the creator of FF III maeson mix would update his patch by adding the dummy monsters, seeing as he has added dummied items it shouldn't be difficult for him. Did you forget about Wario Land 4? Considering that that game does exist, that would make Wario Land (Super Mario Land 3) not be the middle game in the Super Mario Land/Wario Land series. Just giving you a heads up, but I do get your point. Those ones are the ones which I believe should be colorized when possible. Kirby's Dreamland is one I would absolutely love to see, given how we already have a perfectly color match up for what the colors should be in this one (Kirby Super Star Ultra has a full remake of Dreamland 1, so we can take that as the base). Though, I do still believe that Super Mario Land 1 needs another recolorization in the same vein as Super Mario Land 2 by toruzz. 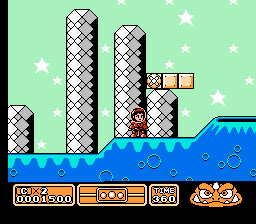 Does KSSU include the level that was cut from the SNES version? I forget which one, but I recall one was cut. The island level? The one which turns into a side scrolling shooting mini game for the Boss? But it's not found in the original Spring Breeze, instead it's in the new mode called Revenge of the King, which is some sort of hard mode for Spring breeze, and they reintroduced Kabula (the boss with the side scrolling shooting gimmick) for that mode alone. I'd love to see this done! I would like everything possible from Trilogy ADDED into UMK3 arcade without removing anything. In fact, add Classic Sub-Zero's extra Fatality. I'd also love to see those colorization hacks done too! Here's a project I tried to complete but don't currently have the skills to accomplish: a translation of the Japanese version of Turtles in Time (SNES). I know the English-language version is just fine, but the Japanese version is actually better in two ways: it has extra dialogue from the bosses (it displays after you defeat them) and there's a stage select code. There isn't much text—but unfortunately, the game's font is compressed. If the font wasn't compressed, I'd love to do the project myself, but I have no idea how to extract or insert compressed graphics. If anyone can get an English font in to the game, I'd love to insert the script or at least offer some assistance. I have screenshots of every line of dialogue and save states shortly before each line of dialogue which might be helpful to anyone who wants to work on the game. could someone please fix the parallel worlds link to the past hack? that cave and all of the village houses are broken and lead to inescapable rooms like that. the rom i'm using is Legend of Zelda, The - A Link to the Past (U) [!]. I managed to circumvent that that system in Sword of Mana on Game Boy Advance not using ROM hacks but by using cheat codes to obtain everything in the game including the summon card in question. I will just offer advice on what to do to get the summon cards, I cheated for plenty of other things in the game but since that is all you are interested in I will limit things to that. Put all those codes in your emulator and you will have all the cards. Then just show each of the 7 summon cards to Chekov and you can REALLY complete quest 41 (he only needs to see one to “clear” the quest but he will keep going for all 7). Another much more tedious method that can be done in emulators is basically described here: https://mana.wikia.com/wiki/Seven_Wisdoms That describes how to do it using two Game Boy Advance systems connected with a link cable. But it can also be done with an emulator able to emulate two GBAs running at once that are connected by a link cable. mGBA, NO$GBA, VBA-M, and VBALink can all do that. VBALink is slightly more advanced in the linking emulation because it can emulate a link cable over a network, while the others can only do it on the same computer. I think VBALink might also support emulation of the GBA wireless adapter but I am not sure. Anyway since Sword of Mana just uses the link cable and not wireless card for GBA, there is much better support for it in emulators if you want to use the long, tedious method. A method that does not involve any cheating or hacks at all, but is annoyingly time-consuming to get up to 100 Amigos in order to get all the summon cards. Yeah so, I prefer just using cheat codes. Much easier! Anyway I am just giving you these workarounds because although it would be nice to have a workaround to the Amigos system via a ROM hack, you can immediately use either of these solutions (cheat codes or emulating a link cable). One of which is easy and gives you all of the summon cards immediately, the other of which is annoying and takes too long. Still if you refuse to cheat and want to do everything 100% legitimately you can try the more tedious method I outlined. I think that is silly though, much better to just put in the cheat codes, get all your summon cards, and be done with it. My wild guesses goes to modify the unused content in SMB3 to put Luigi sprites. As for UMK3, it can be done in the 16-Bit console versions, if we expand the rom size to 8 Megabit. Ultimate Mortal Kombat Trilogy is proof of that. One idea for anyone who wants to make it their personal project, for those of us who know of this but Saga Frontier is considered notoriously unfinished and according the Cutting Room Floor there has been a Japanese group who have attempted to piece the game back together again on whatever was left unused. if you're a SaGa fan you could try to give it a shot. I would like to second this notion please! and just for an idea for a game hack. I have this dream of a Super Mario World hack that would feature 4 players, instead of the 2. and How it would work is that mario and luigi (player 1 and 2) would play levels together while Wario and waluigi would play levels together. and prehaps the objective being some sort of race to the goal on the middle of the map. Its just a pipe dream i guess. I would definitely prefer a colorization of final fantasy legend II. 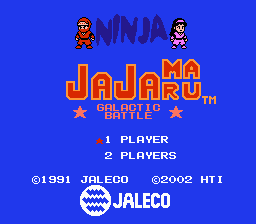 Ninja Jajamaru: Ginga Daisakusen - Pause Doesn't Work! FIX IT! So there's a rather irritating problem with the Japanese version of Ninja Jajamaru: Ginga Daisakusen. The pause button don't work! It only pauses the game while you hold down start, and it's the same problem with the HTI English translation as well. Pause is fixed in the Squashed prototype rom, but I'd also like to see it work in the Japanese version and the HTI translation as well. Can anyone figure it out? ...maybe if the font had been a little bit bigger and perhaps a couple of extra exclamation-points at the end..?